1 Receive 21% off your regular price purchase online only at Forever21.com from 4/14/19 12:00 am PST through 4/16/19 11:59 pm PST. Offer valid online only. Offer valid on regular price items only. Offer cannot be combined with any other coupons, discounts, offers, or promotions. To redeem online, enter code â€œFriends21â€ at checkout. Offer not valid on purchases of gift cards or e-gift cards, applicable taxes, or shipping and handling charges. Offer is not transferable and not valid for cash or cash equivalent. No adjustments on previous purchases. Nothing stated herein will affect customers' legal rights. Forever 21 reserves the right to modify or cancel this promotion at any time without notice. 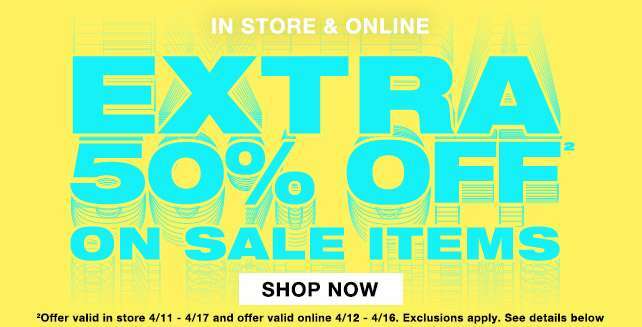 2 Receive an extra 50% off your purchase of select sale items at participating Forever 21 store locations from April 11, 2019 until April 17, 2019 and at forever21.com from April 12, 2019 from 12:00 AM PST until April 16, 2019 11:59 PM PST. While supplies last. To redeem online, enter code EXTRA50 at checkout. For in-store, discount will be taken at the register. Offer valid online only on items marked "50% OFF" only. Offer excludes gift cards, e-gift cards, taxes, and applicable shipping fees. No adjustments on previous purchases. Offer is not transferable and not valid for cash or cash equivalent. Nothing stated herein will affect customers' legal rights. Forever 21 reserves the right to modify or cancel this promotion at any time without notice. Next: [Saks OFF 5th] Extra 20% off－How’s that for a deduction?